What could I say that has not been said about this ink. It is the good ol' reliable cheap high quality go to ink for any ink-head broke or ballin! I have throwing up handstyles with this ink since I was 12 years old. The black is the only color I have always used so I could only say what I know and have experience with. This ink dries hella fast! So if you are not working on and in an area where if you spill, splatter, drop a nib and have it bounce everywhere spraying ink droplets and splash on your mom's kitchen counter/sink/carpet/furniture/washer and dryer/and the likes, then I highly suggest wearing gloves, laying out painters plastic cover, cardboard, and other staining protective measures. This ink does not really have a strong odor that I notice (and NO I am not huffing this ink). It mixes very well with other alcohol based inks and paints. When mixing with paint before using marker/mop/etc. Make sure to give it a good shake to mix it back together. I have used it mixed with 901 Soultip OTR paint plus a dab or two of black Magic Ink in mops and did not have a problem with it drying out the mop head. It can make the mixture a bit runny in a mop. Some like it drippy some like it clean! One thing I did notice when mixed with Magic Ink and used in valve type felt nib markers is if you do not use your marker ofter it can cause sticking issues with the valve which a couple pumps of the nib can fix becareful because the marker feed can hold excess ink when prepping the nib and it will pour out of the feed when hitting up or into the cap when pocketing or storing. Also, if you do not use your valve type marker often this ink can dry the nib out and cause sticky build up on the felt nib which causes streaking. These are not any faults with the ink and thats what makes graff fun because you learn techniques to make yoh a better ink head! It is all about experimenting, getting sloppy, and learning what works best for you as an ink head. Great ink for a cheap price! You cant go wrong! Get it! Fill it! Write it! Btw, Art Primo is the only store I know that sells this 60ml ink well for $2.99. Don't know about it,BE about it! Pretty sick cheap ink!! I put this in an 8mm AP hit and go and did my thang!! (A really good marker and imk combo if on a budget.) would buy again. I got the red, mixed it with some magic ink white, and ran it through a toxic shocker. The ink by itself was translucent, but the white made it helps butter! Great combo for like 12 bucks! here's a free AWSOME marker recipe if your low on cash, go to your local Walmart and you will likely find pen+gear brand black chisel tip markers for less than 50 cents for a 2 pack. pull it apart, let the nib dry out and find something round to rolling-pin the poop ink out of the cartridge, then just FLOOD both with black pilot ink(i held the cartridge upright and filled it slowly until it dripped out the bottom, and covered the nib in ink until it would not absorb more) it will streak at first just run a few lines on smooth paper with a little more pressure than normal and after a few lines this marker kills, just keep it flooded and stick to smooth surfaces like slaps, glass, painted metal, etc. best for slaps if you ask me. 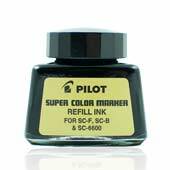 also pilot ink is just great in general, try it in permanent marker you can get your hands on! ITS 1 oz guys, ONE! !